After the previous album; Dawn Of Eternity (2016, see review) Crystal Palace, the band moved from the GAOM label to the other progressive label in Germany; Progressive Promotion Records. 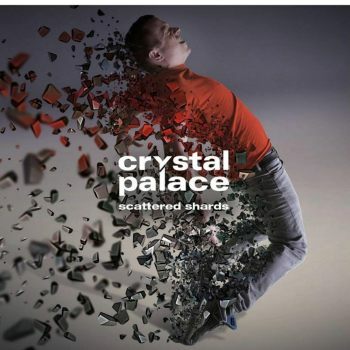 Musically the change doesn't really have consequences for the band's sound, perhaps the progressive rock side of their music is a bit more emphasized, but still the musical power alongside great melodies are the main treatment on the Scattered Shards album. Since the band added drummer Tom Ronney to the line-up, the band has stayed very consistent, so both guitarist Nils Conrad and keyboard player Frank Köhler as well as frontman, vocalist and bass player Yenz have had the chance to work together in a very coherent situation. Scattered Shards shows eight new compositions which hail from the progressive rock side to a more technical progressive metal part. It is the vocals of Jenz that emphasis the progressive rock side. His voice, although very German, has delicate similarities with the legendary Fish, but on the other side I can imagine that his voice is a voice you have to like. The album opens with an emotional keyboard/piano driven track Inside The Box, immediately showing their sensitive side. An unexpected clarinet solo makes this a very interesting composition that sets the bar for the coming tracks. When you take the songs after the first track, you will notice a very warm feeling of recognition. Which means to me that the band has remained honest to their previous music and composed a bunch of solid, dedicated compositions. This also means, I was not really surprised any more while listening to Scattered Shards. And although the compositions are dead solid, I was eager at some point to hear an explosion of power or an intensive battle between both keyboards and guitar. Just during the track Collateral my brows go up; the addition of vocalist Guido Galler and the imbedded spoken parts are enough to lift this song above the others. I wished the nasty guitar that is present during this track was more often used and also the special keyboard solo, during the same track proves Crystal Palace does have what it takes. Although I think the album has solid, dedicated compositions, the band has kept it on the safe side. The songs on the album are songs we can expect from them, no more no less. But sometimes you do have to challenge yourself and dare to be different or at least try to surprise you long-time followers with an unexpected move or sound. In a way I kind of missed that. Nevertheless, Crystal Palace has delivered a very nice album, strengthening their solid status and kept true to themselves and fans.